Dark, beautiful, and oily, a Maduro cigar is a true joy. Finding a good Maduro cigar, though, is a challenge, and finding one that you can purchase at your local cigar shop’s humidor is even more difficult. 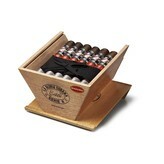 As someone who smokes mainly dark cigars, I can tell you that very often, I end up having to find the Maduro cigars that I want on my usual online cigar shops, because otherwise I cannot be sure of finding them in local stores. The LGC Serie R Esteli Maduros don’t have this problem, thankfully. And who better to make a Nica puro Maduro cigar than the fine folks at La Gloria Cubana? They have so much history in making cigars, and good ones at that, that you are going to find that they are quite capable of mixing the best of cigars and blending the finest of tobaccos, no matter where they may be from. This cigar is a true testament to the abilities of the people at La Gloria Cubana to make a cigar with patience, skill, and an eye toward what may compliment what. So what makes this cigar so amazing? You begin with a dark and oily Maduro wrapper, and then they put fine filler tobacco into it. This filler tobacco, grown in the soil of Nicaragua, is not just delicious; it has also been aged a few years longer than usual, to make sure that it is somewhat mellow, and to unlock a deeper complexity in flavor. All this makes the Serie R Esteli cigars ones that you simply must try, so indulge yourself with one today!